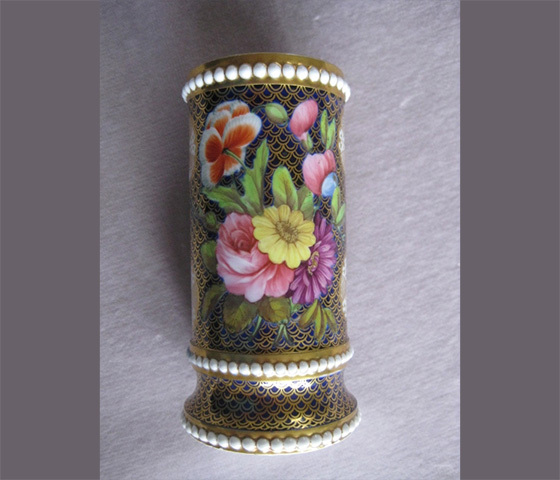 S2773: A nicely shaped New Hall plate with a fancy bow handle. 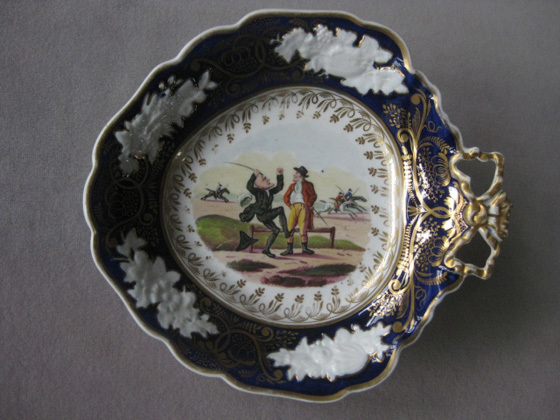 Moulded flowers in white with a blue and gilt ground and painted to the centre with a scene “Dr Syntax loses his money on the race ground at York”. 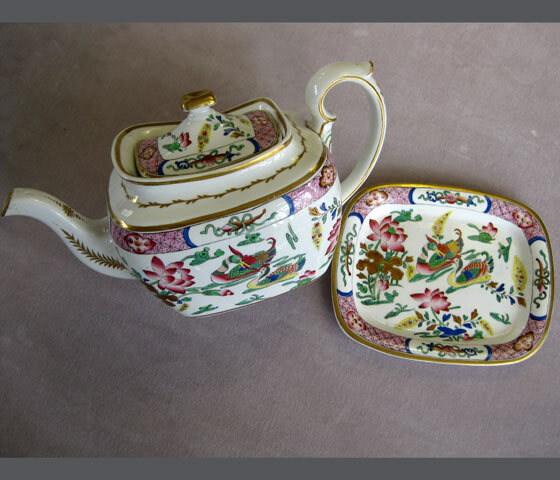 S2398: A fine Spode teapot and stand painted with a bright palette in the famille rose manner with ducks and flowers and with gilt decoration to edges,handle and spout. 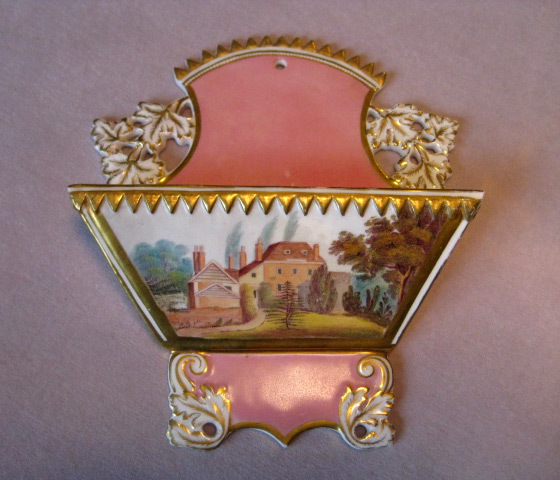 S2857 : A rare Coalport letter rack with a painted view of an English country house to the front below a crenelated gilt border. 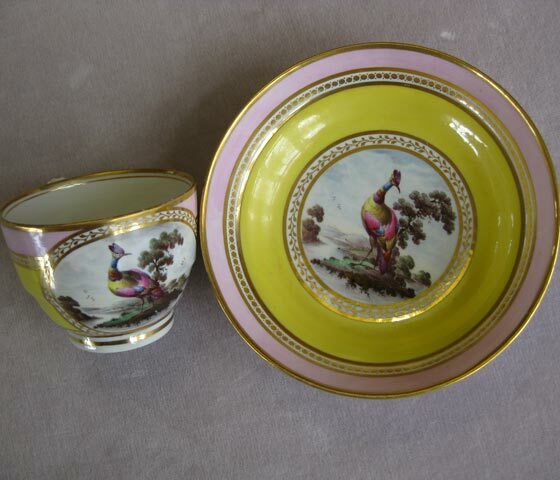 The back and bottom parts painted pink with gilt floral moulding. 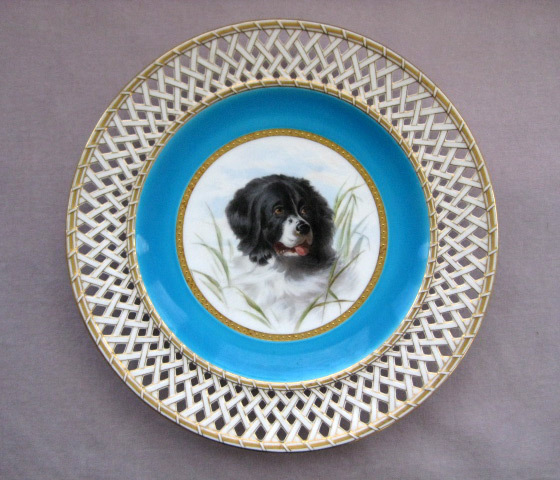 S2858 : A very decorative Minton plate with a gilt edged reticulated border surrounding a blue and gilt framed cartouche painted with a Newfoundland dog by Henry Mitchell. 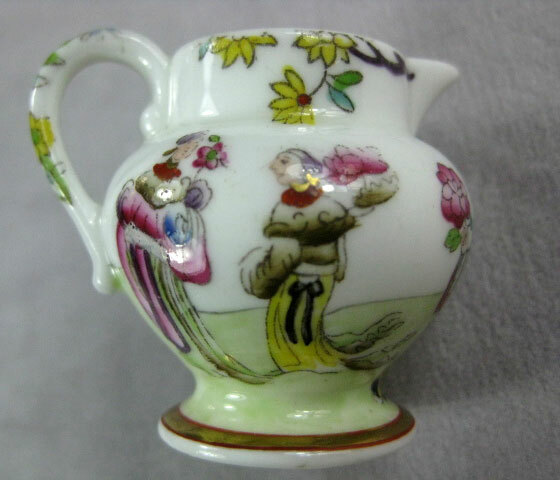 S2788: A large bone china porcelain jug with six sides of an inverted baluster form with gilt edges and borders and painted with sprays of flowers to four panels. 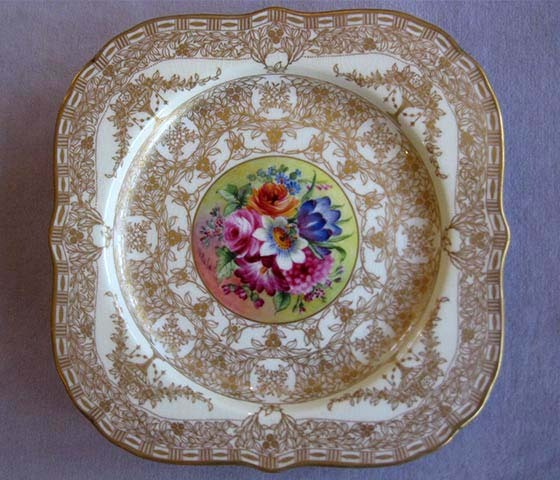 “Presented to Baillie Darling as a small token of respect Kelso June 10th 1845” - 'bailie' being a Scottish word for a magistrate. 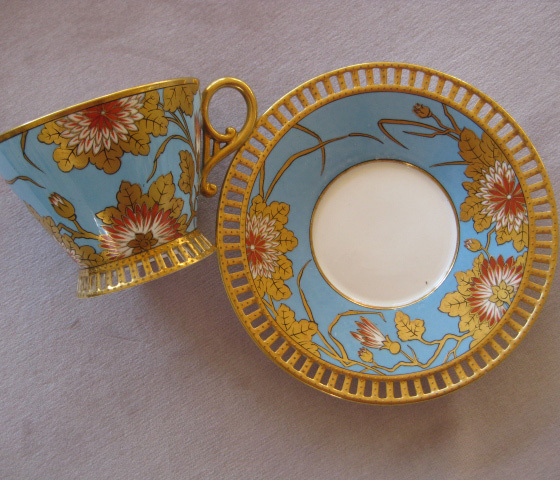 S2940: A richly decorated Chamberlain cup and saucer with gilt gadrooned edges. 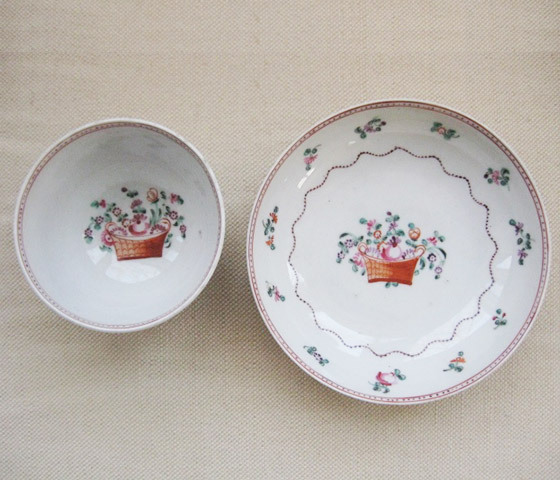 Unmarked Pattern no 298 Circa 1820. 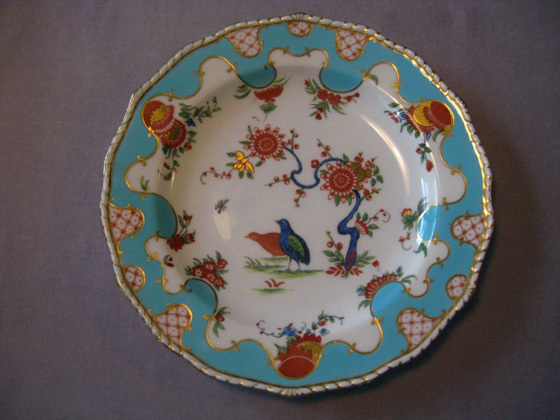 S2791: A fine Derby plate with a gilt framed pale blue border and decorated to the centre with the “two quail “ pattern. Impressed mark and printed mark. 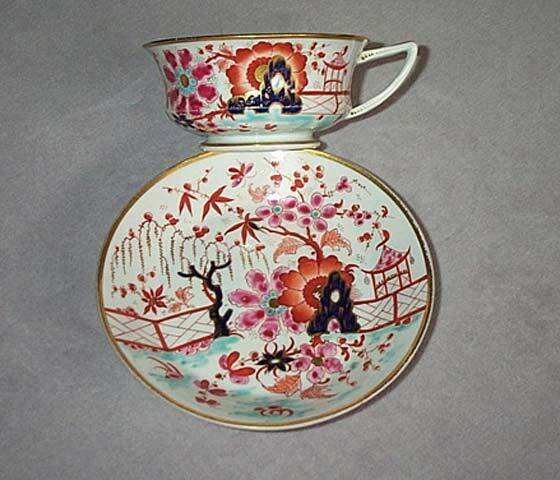 Also Tiffany & Co.
S2635 : A Spode miniature jug brightly painted in polychrome with Chinese figures in a garden. 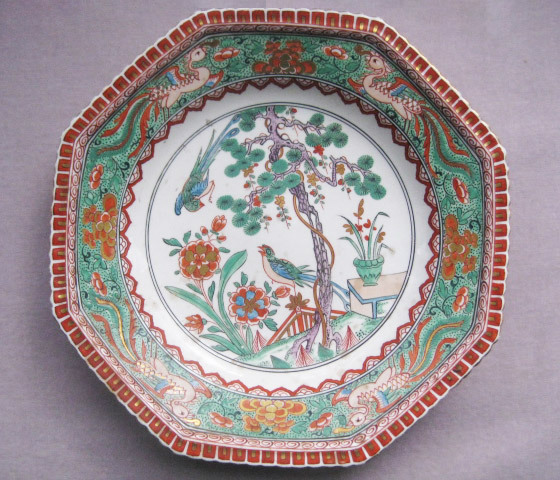 S2299 : A Worcester, Flight Barr & Barr, rare Etruscan shaped cup and saucer with an angular handle and beautifully painted with a Chinese garden scene. 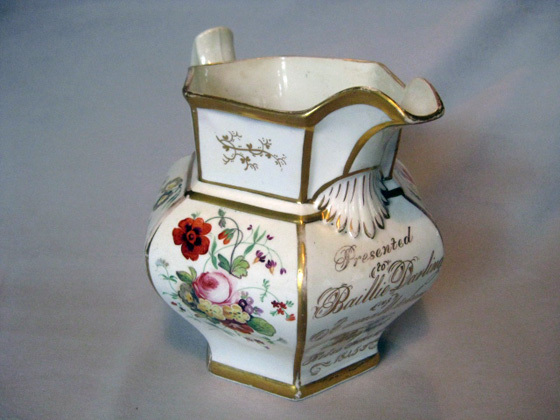 S2639: A fine Spode miniature jug and basin in a decoratively octagonal shape. 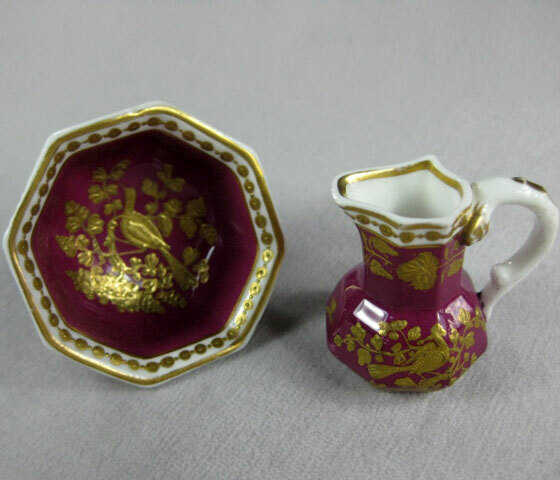 It has a claret coloured ground and has tooled gilt decoration of birds amongst foliage. 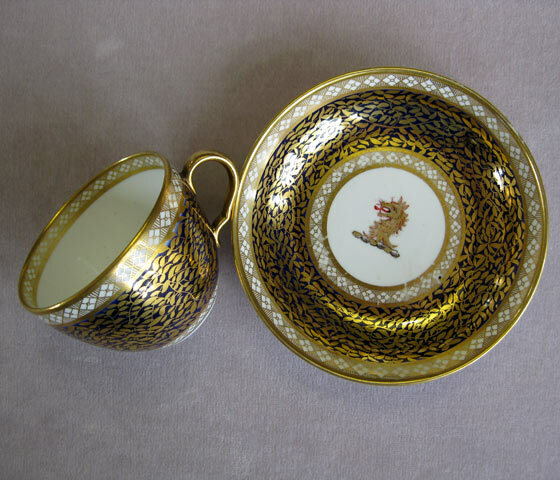 S2391: A Spode bone china bute shaped cup and saucer richly decorated with New Hall’s pattern number 556. 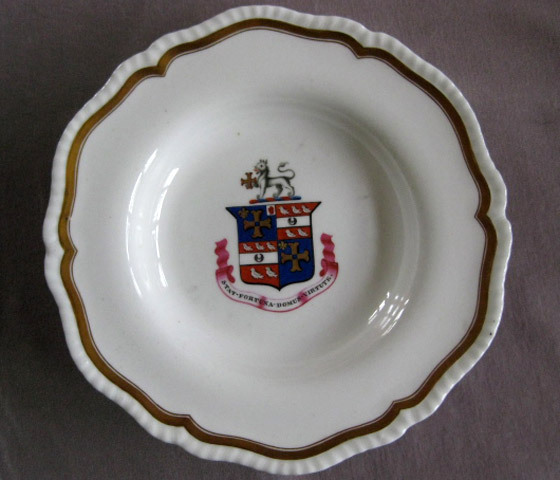 The saucer base having a family crest. 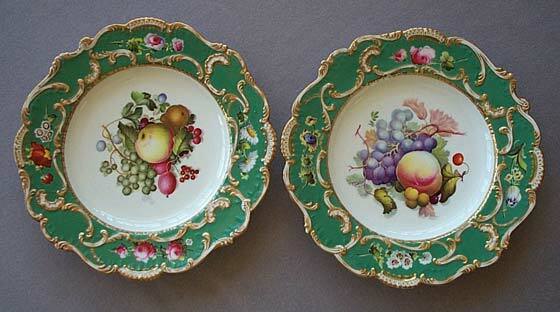 S2206: A fine pair of Minton plates with moulded borders in green and gilt surrounding small vignettes of flowers. the centre delightfully painted with flowers and fruit by Thomas Steele. 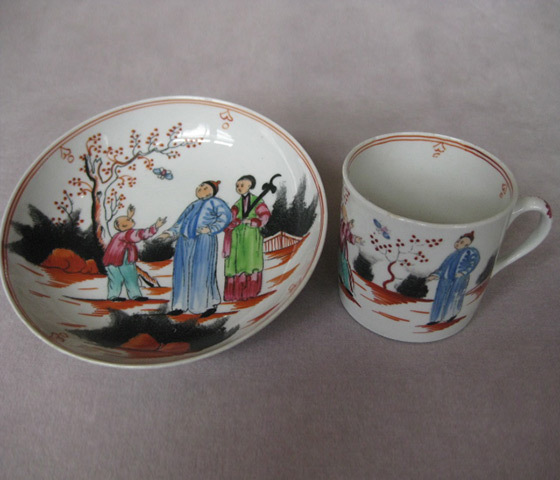 Unmarked Circa 1830 Width 9"
S2862 : A New Hall coffee can and saucer decorated with the "Boy and butterfly" pattern. 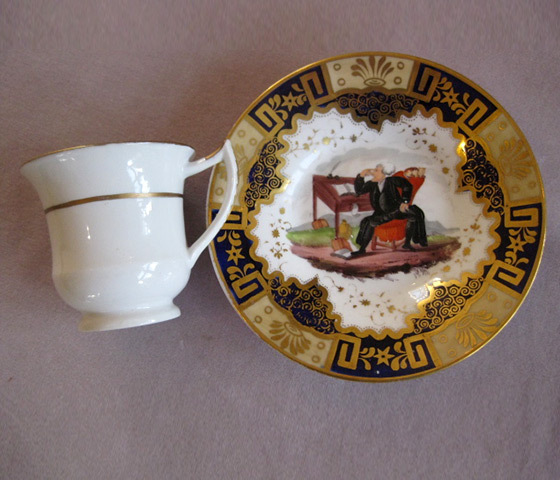 S2388: A very fine Minton cup and saucer. 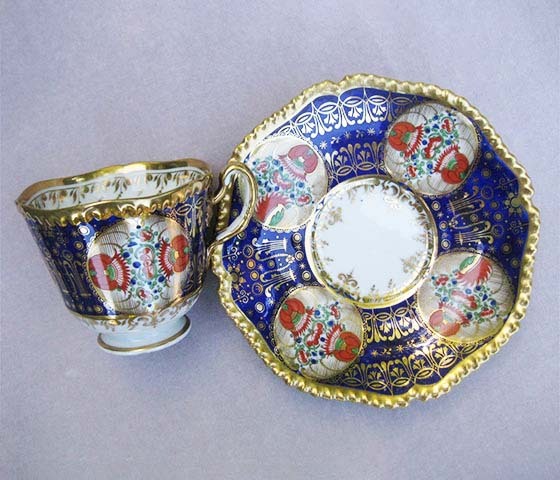 The saucer with a deep blue ground and the well and border with tooled gilt decoration. 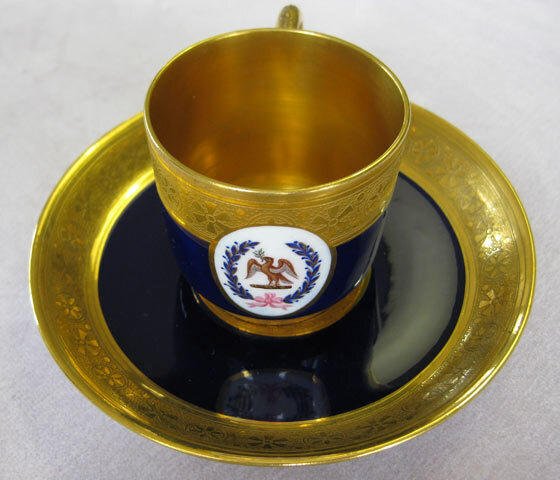 The cup similarly decorated and fully gilt to the inside. 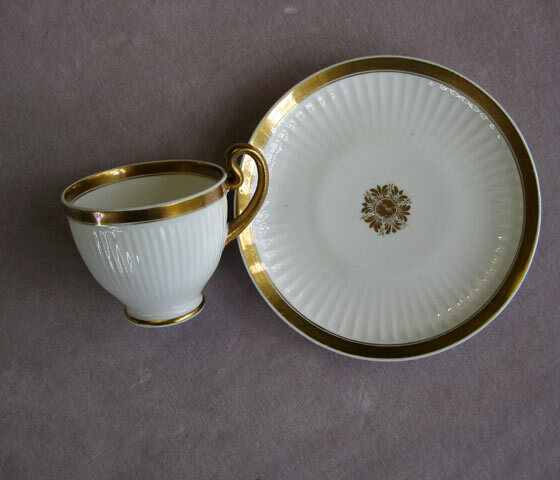 S2435: A fine Swansea porcelain cup and saucer with Paris fluted moulding and a high curved loop handle with a gilt border. 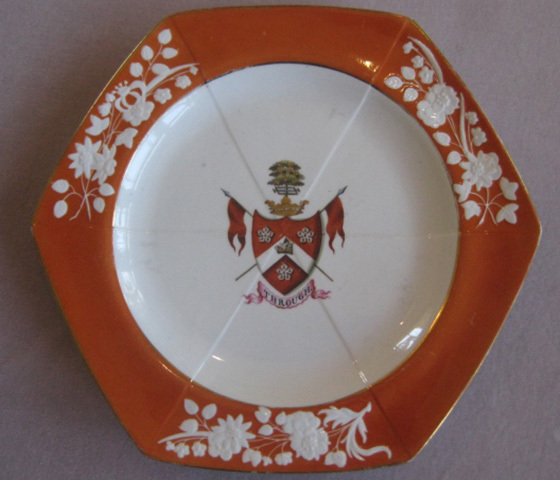 S2742: A Spode enveloped shape armorial plate with a moulded white floral border on an orange ground.The arms are for The Duke and Marquess Hamilton,Marquess of Douglas and Clydesdale,earl of Angus,Duke of Brandon and Baron of Dutton 7 Duke of Chatelherault. 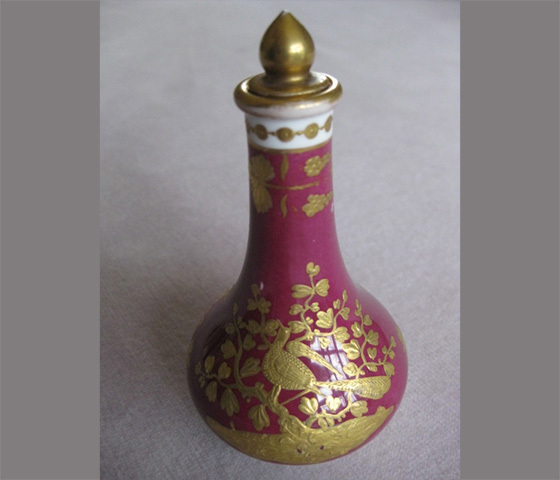 S2690: A fine Spode perfume bottle listed in Spode's shape book as New Shape Lizard Bottle decorated with tooled gilt birds and foliage on a crimson ground. 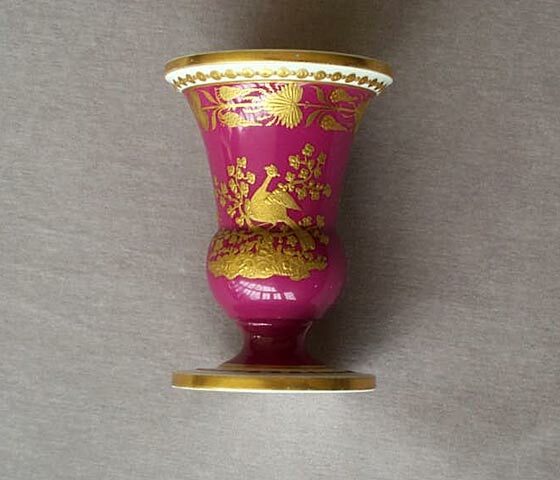 S2691: A S2691: Spode Incense Burner decorated with tooled gilt birds and foliage on a crimson ground. 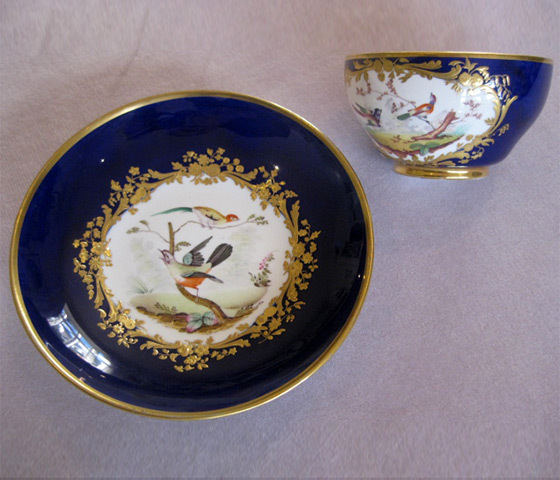 S2905 : A fine Derby cup and saucer decorated in the Sevres style on a gily lined mazarin blue ground and with tooled gilt reserves containing painting of birds in landscape. 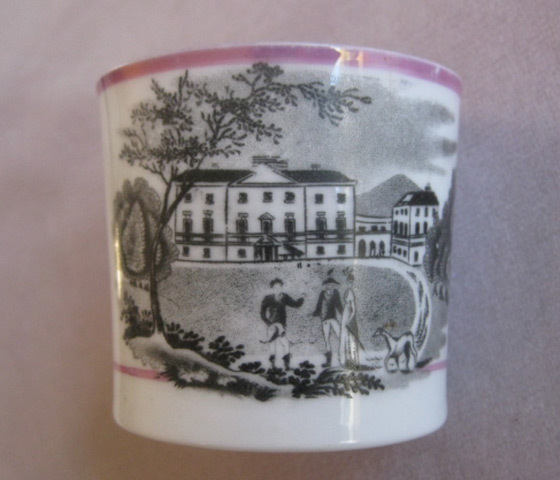 probably by Horatio Steele. 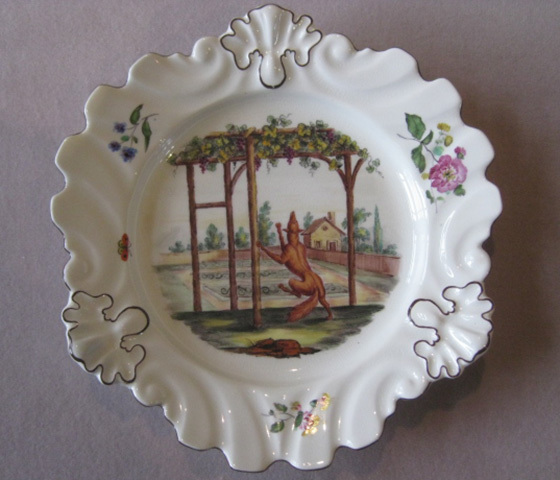 S2727: A rare Copeland plate in the Chelsea silver shape form and painted to the centre with a scene from Aesops fables of the Fox & Grapes. S2713: A fine Graingers Worcester trio bearing the arms and motto for the Anketells. 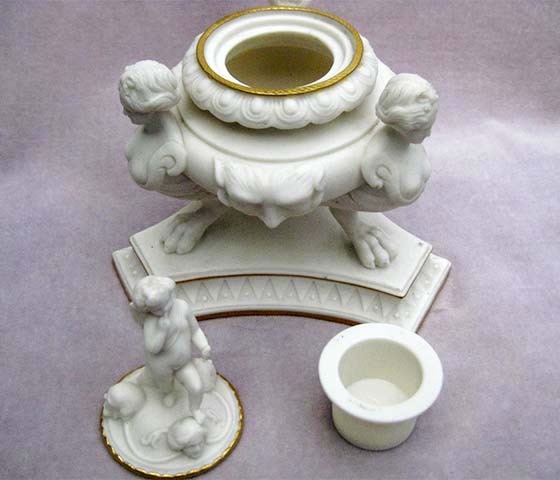 The motto “vade ad formic an” . William Anketell, of Anketell Grove, County Monaghan, Ireland, was the son of Lt.-Col. Matthew Anketell and Mary Norris. 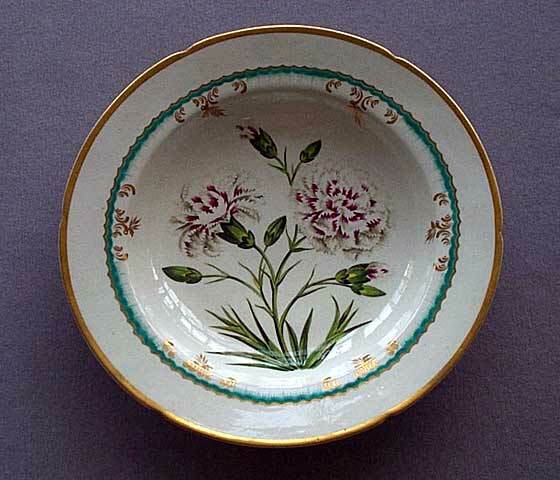 He married Sarah Maxwell, daughter of Lt.-Col. John Charles Frederick Waring Maxwell, on 23 June 1809. 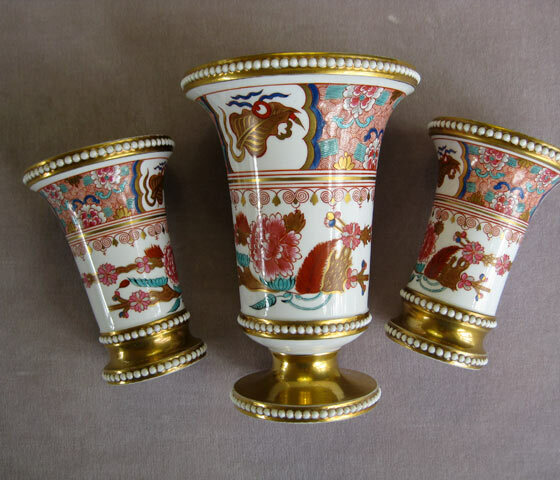 On 20 November 1828, he became the head of the Ancketill/Anketell family, succeeding his uncle, Charles Anketell. 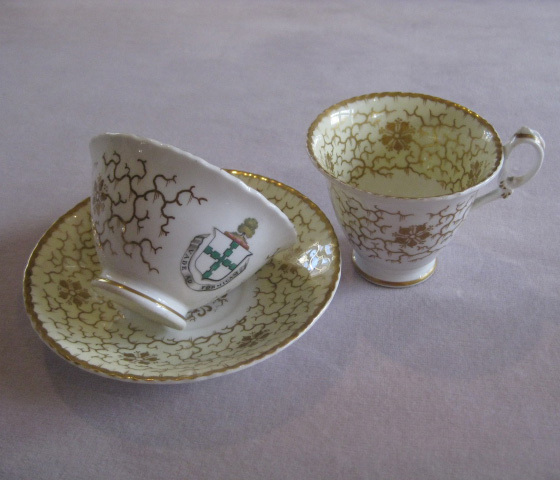 He held various offices of High Sheriff in 1830, Deputy Lieutenant (D.L. ), and Justice of the Peace (J.P.). 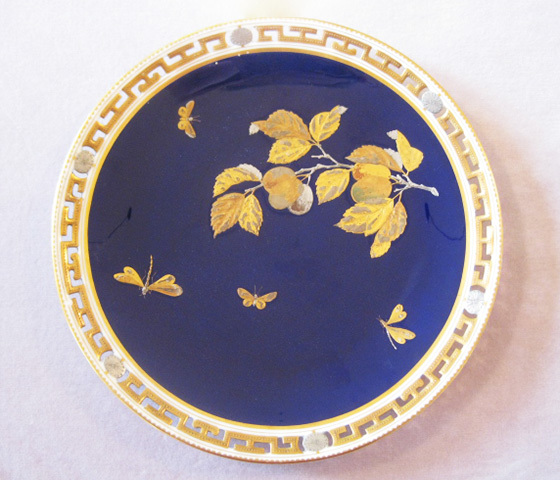 S2798: A Minton plate with a reticulated gilt and silvered border .The deep blue ground colour painted in gilt and silver ( platinum) with leaves ,berries and insects. 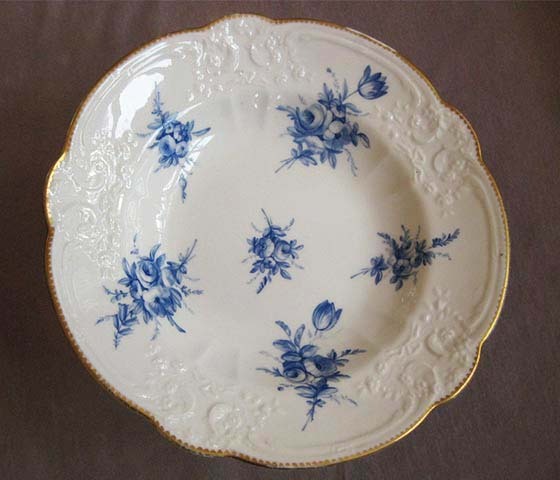 S2953: A fine quality Nantgarw soup plate with a moulded and gilt edge and painted with sprays of flowers in a monochrome cornflower blue. 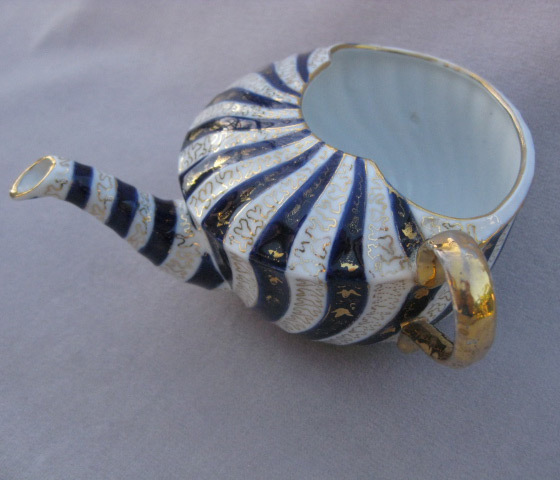 S2812: A Maws invalid feeding cup which is spirally fluted with alternating flutes of blue and gilt and white and gilt. 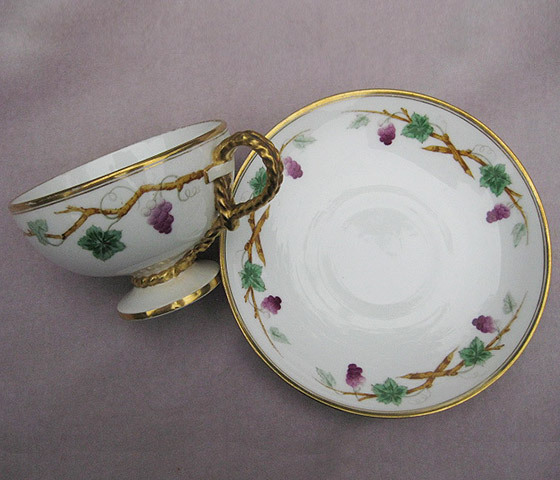 S2828: A fine quality Brown -Westhead Moore cup and saucer with gilt rims and the interesting twisted rope handle and painted with vine branches , leaves and bunches of grapes. 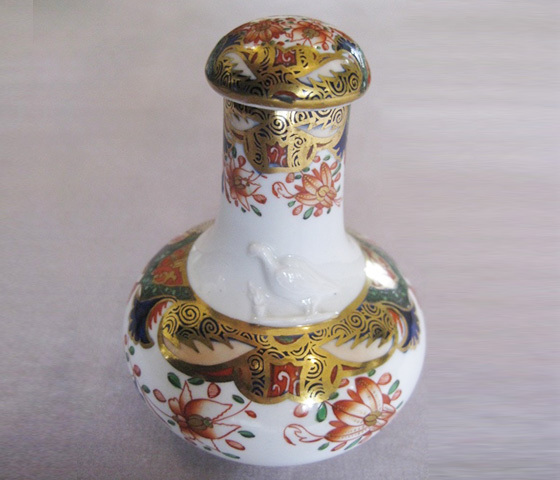 S2792: A Spode lizard shaped perfume bottle and stopper painted in an Imari stlyed pattern. 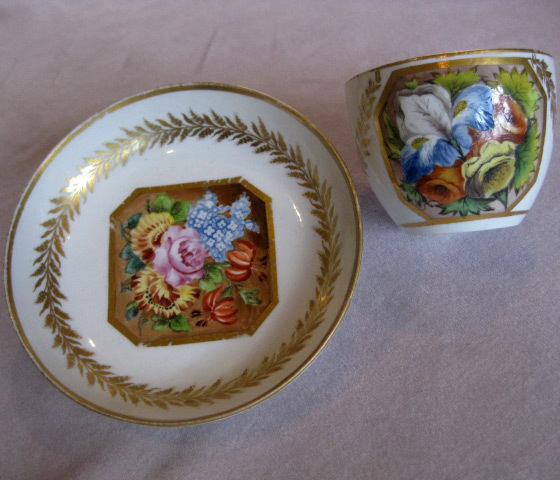 S2907 : A possibly, Caughley or Coalport cup and saucer and decorated at Mansfield with an octagonal gilt reserve containing a group of coloured flowers and a gilt laurel border and giltrims. 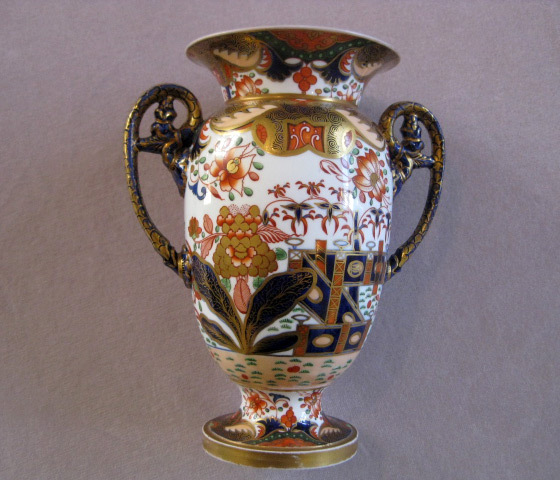 S2908 : A fine quality Spode "new French shape" vase decorated in the popular pattern 967. 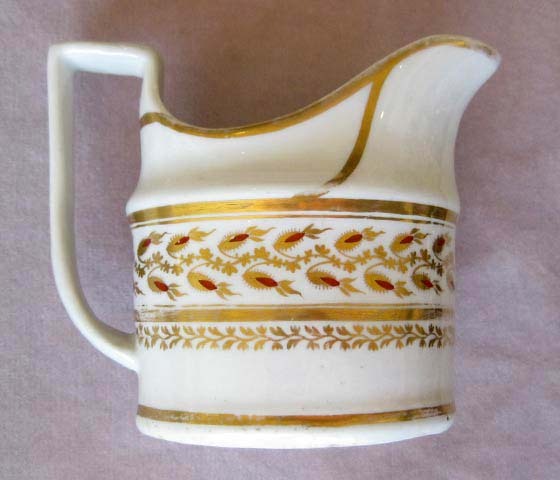 S2968: A Graingers Worcester creamer in the new gadroon shape. 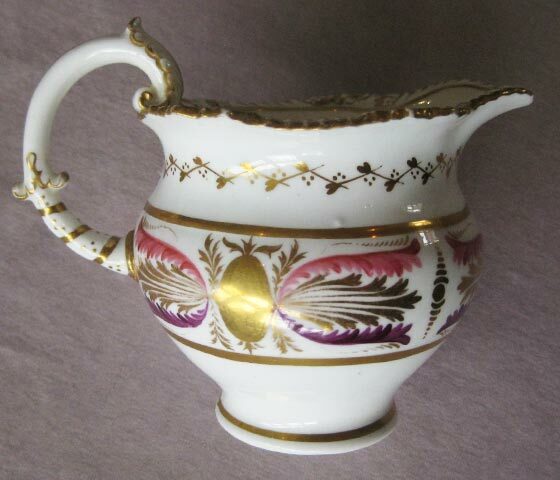 The top edge moulded with flowers and decorated in gilt the body with purple , gilt and pink lyre shaped decoration. 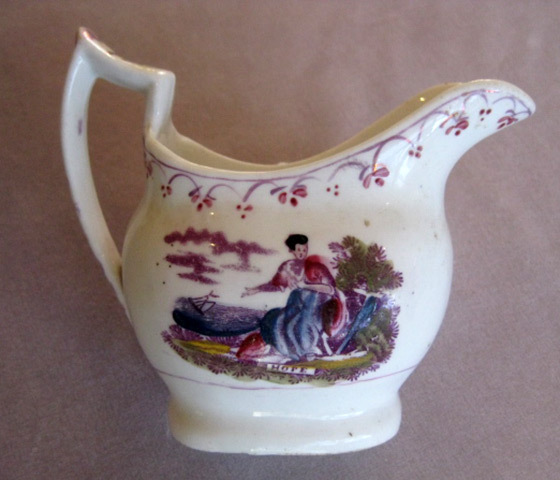 S2920: A London shaped porcelain creamer with a spur handle printed and painted with " Faith" and " Hope" to either side. 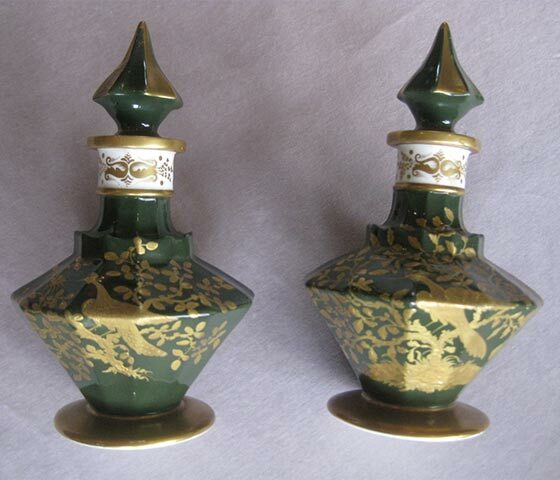 Possibly Rathbone Height 2 3/8"
S2969: A fine and rare pair of Spode perfume bottles decorated on a green ground with a tooled gilt peacock like bird in a multi branched tree. 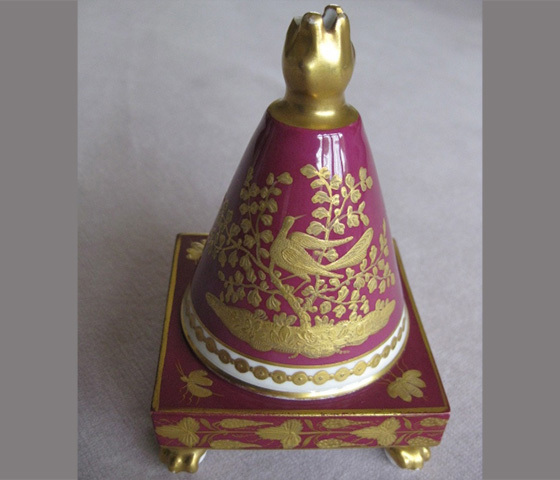 A spread flat gilt base and a stopper which is a spire shape and eight fluted facets. 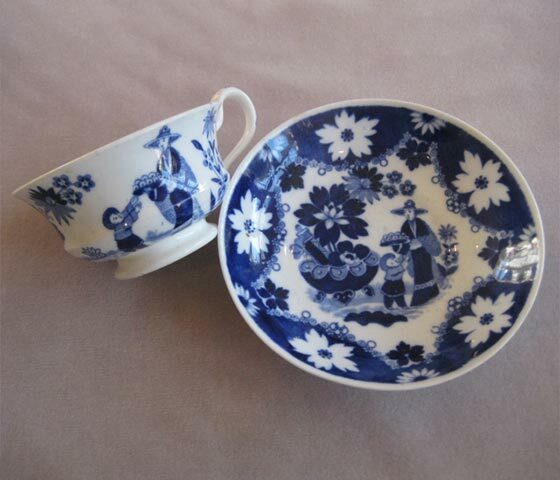 S2916: A Hilditch porcelain cup and saucer decorated with the “Eskimo Child” pattern in blue.